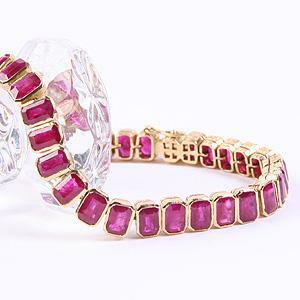 Emerald Cut Ruby Bracelet at Reliable Gold in Rhode Island Reliable Gold Ltd.
18K emerald cut ruby bracelet with 36 bezel set stones of exceptional color. Each stone measures 5.5mm x 4mm x 2.4mm total weight appx. 24.34 cts. Sizes: Measures 7" length x 1/4" wide.